Many preachers prepare sermons designed to reach the crowd at a seminary chapel service. They imagine their seminary professors sitting in the back pew critiquing their sermons. Other preachers sound like they have just come from a creative writing retreat. They have read everything Barbara Brown Taylor and Fred Craddock have written and seek to imitate it. If you are preaching every week to other preachers and professors, stick with this approach. However, if it is your goal to reach the majority of listeners in churches you must change your approach. So, what is the secret to great preaching? It is three simple words: Engage your listeners! You know, those people you are talking to in worship — the ones who chose not to do a thousand other things on a weekend so they might hear a relevant word from God for their lives. Many preachers assume their listeners will be engaged regardless of what they say and how they say it. This is a fatal mistake. Engaging your listeners is not pandering to them or entertaining them; it’s respecting them and caring about them. This may sting a little but if you want to be a great preacher you must accept it: “If people aren’t interested they’re not listening.” Oh, they may look like they’re listening but their minds and hearts are far away. They are thinking about the talk they must have with their bosses on Monday, their grocery lists, where they are going to lunch after worship, or the texts they have received that look more interesting than anything you are saying. They have checked out, and the opportunity for them to be transformed by your message has been lost. So how do you get your listeners interested in what you have to say? To begin with, stop thinking about your seminary textbooks, commentaries, and professors, and start thinking about the lives of your listeners. To be blunt: Don’t be selfish when you prepare sermons. Think of others when you preach! Ask yourself, how will this biblical message engage those who take the time to get up, dress up, and show up to worship? When you preach there may be a woman sitting in the back who is going through a bitter divorce. There may be a teenager who has been dragged to worship by his parents. There may be a man sitting near the front who hasn’t been to church in years because of how harshly he was treated by his Christian friends. How will your sermon connect with each of these people? Will it connect? Be honest. Will they remember what you said 30 minutes after worship? Here is a good exercise. If you are currently serving a church, spend ten minutes writing down everything you know about your people, both good and bad — health issues, peer pressures, questions of faith, marital problems, graduations, family problems, issues with kids, issues at work, births, deaths, personal struggles and temptations, new jobs, job layoffs, money problems, great achievements in sports, and so on. Engaging your listeners is not pandering to them or entertaining them; it’s respecting them and caring about them. When you engage your listeners, you are showing sensitivity to where they are in their lives and offering something that could help them. Average listeners today don’t care what you have to say if they don’t sense that you understand them and care about them. Jesus knew this, which is why he was such an outstanding communicator. The Bible says of Jesus, “The large crowd listened to him with delight” (Mark 12:37). Why? Because he engaged them. He walked among them, listening to them, caring for them, and healing them. He told stories and illustrated his messages with everyday examples they could understand. Jesus’s listeners knew he cared, which is why they probably hung on his every word. Jesus was figuratively and literally “the Word … made flesh” (John 1:14 KJV). Good preaching is making the “word become flesh” for your listeners. Adapted from That’ll Preach! 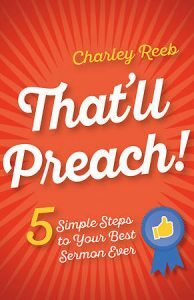 5 Simple Steps to Your Best Sermon Ever (Abingdon Press: 2017) by Charley Reeb. Used by permission. All rights reserved. The book is available at Cokesbury and Amazon.